Andreas Nikolaus "Niki" Lauda (born 22 February 1949) is an Austrian former Formula One driver and a three-time F1 World Drivers' Champion, winning in 1975, 1977 and 1984. He is currently the only driver to have been champion for both Ferrari and McLaren, the sport's two most successful constructors. He is considered by some as one of the greatest F1 drivers of all time. More recently an aviation entrepreneur, he has founded and run three airlines (Lauda Air, Niki, and Laudamotion). He is also Bombardier Business Aircraft brand ambassador. He was also a consultant for Scuderia Ferrari and team manager of the Jaguar Formula One racing team for two years. He is currently working as a pundit for German TV during Grand Prix weekends and acts as non-executive chairman of the Mercedes AMG Petronas F1 Team. Lauda owns 10% of the team. Lauda at the Nürburgring in 1973, three years before his accident. Having emerged as Formula One's star driver amid a 1975 title win and leading the 1976 championship battle, Lauda was seriously injured in a crash at the 1976 German Grand Prix at the Nürburgring during which his Ferrari burst into flames, and he came close to death after inhaling hot toxic fumes and suffering severe burns. However, he survived and recovered enough to race again just six weeks later at the Italian Grand Prix. Although he narrowly lost the title to James Hunt that year, he won his second Ferrari crown the year after during his final season at the team. After a couple of years at Brabham and two years' hiatus, Lauda returned and raced four seasons for McLaren between 1982 and 1985 – during which he won the 1984 title by 0.5 points over his team colleague Alain Prost. Niki Lauda was born on 22 February 1949 in Vienna, Austria, to a wealthy family. His paternal grandfather was the Viennese-born businessman Hans Lauda. Lauda became a racing driver despite his family's disapproval. After starting out with a Mini, Lauda moved on into Formula Vee, as was normal in Central Europe, but rapidly moved up to drive in private Porsche and Chevron sports cars. With his career stalled, he took out a £30,000 bank loan, secured by a life insurance policy, to buy his way into the fledgling March team as a Formula Two (F2) driver in 1971. Because of his family's disapproval he had an ongoing feud with them over his racing ambitions and abandoned further contact. He was quickly promoted to the F1 team, but drove for March in F1 and F2 in 1972. Although the F2 cars were good (and Lauda's driving skills impressed March principal Robin Herd), March's 1972 F1 season was catastrophic. Perhaps the lowest point of the team's season came at the Canadian Grand Prix at Mosport Park, where both March cars were disqualified within 3 laps of each other after just past 3/4 race distance. Lauda took out another bank loan to buy his way into the BRM team in 1973. Lauda was instantly quick, but the team was in decline; his big break came when his BRM teammate Clay Regazzoni left to rejoin Ferrari in 1974 and team owner Enzo Ferrari asked him what he thought of Lauda. Regazzoni spoke so favourably of Lauda that Ferrari promptly signed him, paying him enough to clear his debts. After an unsuccessful start to the 1970s culminating in a disastrous start to the 1973 season, Ferrari regrouped completely under Luca di Montezemolo and were resurgent in 1974. The team's faith in the little-known Lauda was quickly rewarded by a second-place finish in his debut race for the team, the season-opening Argentine Grand Prix. His first Grand Prix (GP) victory – and the first for Ferrari since 1972 – followed only three races later in the Spanish Grand Prix. Although Lauda became the season's pacesetter, achieving six consecutive pole positions, a mixture of inexperience and mechanical unreliability meant Lauda won only one more race that year, the Dutch GP. He finished fourth in the Drivers' Championship and demonstrated immense commitment to testing and improving the car. 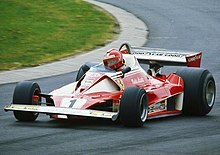 The 1975 F1 season started slowly for Lauda; after no better than a fifth-place finish in the first four races, he won four of the next five driving the new Ferrari 312T. His first World Championship was confirmed with a third-place finish at the Italian Grand Prix at Monza; Lauda's teammate Regazzoni won the race and Ferrari clinched their first Constructors' Championship in 11 years; Lauda then picked up a fifth win at the last race of the year, the United States GP at Watkins Glen. He also became the first driver to lap the Nürburgring Nordschleife in under seven minutes, which was considered a huge feat as the Nordschleife section of the Nürburgring was two miles longer than it is today. Lauda famously gave away any trophies he won to his local garage in exchange for his car to be washed and serviced. Unlike 1975 and despite tensions between Lauda and Montezemolo's successor, Daniele Audetto, Lauda dominated the start of the 1976 F1 season, winning four of the first six races and finishing second in the other two. By the time of his fifth win of the year at the British GP, he had more than double the points of his closest challengers Jody Scheckter and James Hunt, and a second consecutive World Championship appeared a formality. It would be a feat not achieved since Jack Brabham's victories in 1959 and 1960. He also looked set to win the most races in a season, a record held by the late Jim Clark since 1963. A week before the 1976 German Grand Prix at the Nürburgring, even though he was the fastest driver on that circuit at the time, Lauda urged his fellow drivers to boycott the race, largely because of the 23-kilometre (14 mi) circuit's safety arrangements, citing the organisers' lack of resources to properly manage such a huge circuit- i.e. the lack of fire marshals; fire and safety equipment and safety vehicles. Most of the other drivers voted against the boycott and the race went ahead. On 1 August 1976 during the second lap at the very fast left kink before Bergwerk, Lauda was involved in an accident where his Ferrari swerved off the track, hit an embankment, burst into flames and made contact with Brett Lunger's Surtees-Ford car. Unlike Lunger, Lauda was trapped in the wreckage. Drivers Arturo Merzario, Lunger, Guy Edwards and Harald Ertl arrived at the scene a few moments later, but before Merzario was able to pull Lauda from his car, he suffered severe burns to his head and inhaled hot toxic gases that damaged his lungs and blood. As Lauda was wearing a modified helmet, the foam had compressed and it slid off his head after the accident, leaving his face exposed to the fire. Although Lauda was conscious and able to stand immediately after the accident, he later lapsed into a coma. 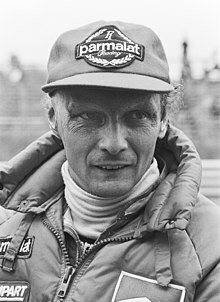 Lauda suffered extensive scarring from the burns to his head, losing most of his right ear as well as the hair on the right side of his head, his eyebrows and his eyelids. He chose to limit reconstructive surgery to replacing the eyelids and getting them to work properly. Since the accident he has always worn a cap to cover the scars on his head. He has arranged for sponsors to use the cap for advertising. With Lauda out of the contest, Carlos Reutemann was taken on as his replacement. Ferrari boycotted the Austrian Grand Prix in protest at what they saw as preferential treatment shown towards McLaren driver James Hunt at the Spanish and British Grands Prix. Lauda missed only two races, appearing at the Monza press conference six weeks after the accident with his fresh burns still bandaged. He finished fourth in the Italian GP, despite being, by his own admission, absolutely petrified. F1 journalist Nigel Roebuck recalls seeing Lauda in the pits, peeling the blood-soaked bandages off his scarred scalp. He also had to wear a specially adapted crash helmet so as to not be in too much discomfort. In Lauda's absence, Hunt had mounted a late charge to reduce Lauda's lead in the World Championship standings. Hunt and Lauda were friends away from the circuit, and their personal on-track rivalry, while intense, was cleanly contested and fair. Following wins in the Canadian and United States Grands Prix, Hunt stood only three points behind Lauda before the final race of the season, the Japanese Grand Prix. Lauda qualified third, one place behind Hunt, but on race day there was torrential rain and Lauda retired after two laps. He later said that he felt it was unsafe to continue under these conditions, especially since his eyes were watering excessively because of his fire-damaged tear ducts and inability to blink. Hunt led much of the race before his tires blistered and a pit stop dropped him down the order. He recovered to third, thus winning the title by a single point. Lauda's previously good relationship with Ferrari was severely affected by his decision to withdraw from the Japanese Grand Prix, and he endured a difficult 1977 season, despite easily winning the championship through consistency rather than outright pace. Lauda disliked his new teammate, Reutemann, who had served as his replacement driver. Lauda was not comfortable with this move and felt he had been let down by Ferrari. "We never could stand each other, and instead of taking pressure off me, they put on even more by bringing Carlos Reutemann into the team." Having announced his decision to quit Ferrari at season's end, Lauda left earlier after he won the Drivers' Championship at the United States Grand Prix because of the team's decision to run the unknown Gilles Villeneuve in a third car at the Canadian Grand Prix. Having joined Parmalat-sponsored Brabham-Alfa Romeo in 1978 for a $1 million salary, Lauda endured two unsuccessful seasons, notable mainly for his one race in the Brabham BT46B, a radical design known as the Fan Car: it won its first and only race at the Swedish GP, but Brabham did not use the car in F1 again; other teams vigorously protested the fan car's legality and Brabham team owner Bernie Ecclestone, who at the time was maneuvering for acquisition of Formula One's commercial rights, did not want to fight a protracted battle over the car, but the victory in Sweden remained official. The Brabham BT46 Alfa Romeo flat-12 began the 1978 season at the third race in South Africa. It suffered from a variety of troubles that forced Lauda to retire the car 9 out of 14 races. Lauda's best results, apart from the wins in Sweden and Italy after the penalization of Mario Andretti and Gilles Villeneuve, were 2nd in Montreal and Great Britain, and a 3rd in the Netherlands. As the Alfa flat-12 engine was too wide for effective wing cars designs, Alfa provided a V12 for 1979. It was the fourth 12cyl engine design that propelled the Austrian in F1 since 1973. Lauda's 1979 F1 season was again marred by retirements and poor pace, even though he won the non-championship 1979 Dino Ferrari Grand Prix with the Brabham-Alfa. In the single make BMW M1 Procar Championship, driving for the British Formula Two team Project Four Racing (led by Ron Dennis) when not in a factory entry, Lauda won three races for P4 plus the series. Decades later, Lauda won a BMW Procar exhibition race event before the 2008 German Grand Prix. In September, Lauda finished 4th in Monza, and won the non-WC Imola event, still with the Alfa V12 engine. After that, Brabham returned to the familiar Cosworth V8. In late September, during practice for the 1979 Canadian Grand Prix, Lauda informed Brabham that he wished to retire immediately, as he had no more desire to "drive around in circles". Lauda, who in the meantime had founded Lauda Air, a charter airline, returned to Austria to run the company full-time. In 1982 Lauda returned to racing. After a successful test with McLaren, the only problem was in convincing then team sponsor Marlboro that he was still capable of winning. Lauda proved he was when, in his third race back, he won the Long Beach Grand Prix. Before the opening race of the season at Kyalami race track in South Africa, Lauda was the organiser of the so-called "drivers' strike"; Lauda had seen that the new Super Licence required the drivers to commit themselves to their present teams and realised that this could hinder a driver's negotiating position. The drivers, with the exception of Teo Fabi, barricaded themselves in a banqueting suite at Sunnyside Park Hotel until they had won the day. 1983 proved to be a transitional year for the McLaren team as they were making a change from Ford-Cosworth power to TAG-badged Porsche turbo power, and Lauda did not win a race that season, with his best finish being 2nd at Long Beach behind his teammate John Watson. Some political maneuvering by Lauda forced a furious chief designer John Barnard to design an interim car earlier than expected to get the TAG-Porsche engine some much needed race testing; Lauda nearly won the last race of the season in South Africa. Lauda won a third world championship in 1984 by half a point over teammate Alain Prost, due only to half points being awarded for the shortened 1984 Monaco Grand Prix. His Austrian Grand Prix victory that year is so far the only time an Austrian has won his home Grand Prix. Initially, Lauda did not want Prost to become his teammate, as he presented a much faster rival. However, during the two seasons together, they had a good relationship and Lauda later said that beating the talented Frenchman was a big motivator for him. The whole season continued to be dominated by Lauda and Prost, who won 12 of 16 races. Lauda won five races, while Prost won seven. However, Lauda, who set a record for the most pole positions in a season during the 1975 season, rarely matched his teammate in qualifying. Despite this, Lauda's championship win came in Portugal, when he had to start in eleventh place on the grid, while Prost qualified on the front row. Prost did everything he could, starting from second and winning his 7th race of the season, but Lauda's calculating drive (which included setting the fastest race lap), passing car after car, saw him finish second behind his teammate which gave him enough points to win his third title. His second place was a lucky one though as Nigel Mansell was in second for much of the race. However, as it was his last race with Lotus before joining Williams in 1985, Lotus boss Peter Warr refused to give Mansell the brakes he wanted for his car and the Englishman retired with brake failure on lap 52. As Lauda had passed the Toleman of F1 rookie Ayrton Senna for third place only a few laps earlier, Mansell's retirement elevated him to second behind Prost. 1985 was a poor season for Lauda, with eleven retirements from the fourteen races he started. He did not start the Belgian Grand Prix at Spa-Francorchamps after crashing and breaking his wrist during practice, and he later missed the European Grand Prix at Brands Hatch; John Watson replaced him for that race. He did manage 4th at the San Marino Grand Prix, 5th at the German Grand Prix, and a single race win at the Dutch Grand Prix where he held off a fast finishing Prost late in the race. This proved to be his last Grand Prix victory and also the last Formula One Grand Prix held in the Netherlands. After announcing his impending retirement at the 1985 Austrian Grand Prix, he retired for good at the end of that season. Lauda's final Formula One Grand Prix drive was the inaugural Australian Grand Prix in Adelaide, South Australia. After qualifying 16th, a steady drive saw him leading by lap 53. However, the McLaren's ceramic brakes suffered on the street circuit and he crashed out of the lead at the end of the long Brabham Straight on lap 57 when his brakes finally failed. He was one of only two drivers in the race who had driven in the non-championship 1984 Australian Grand Prix, the other being 1982 World Champion Keke Rosberg, who won in Adelaide in 1985 and would take Lauda's place at McLaren in 1986. In 1993 Lauda returned to Formula One in a managerial position when Luca di Montezemolo offered him a consulting role at Ferrari. Halfway through the 2001 season Lauda assumed the role of team principal of the Jaguar Formula One team. The team, however, failed to improve and Lauda was made redundant, together with 70 other key figures, at the end of 2002. In September 2012 he was appointed non-executive chairman of the Mercedes AMG Petronas F1 Team. He took part in the negotiations of signing Lewis Hamilton to a three-year deal with AMG Mercedes. Lauda's helmet was originally a plain red with his full name written on both sides and the Raiffeisen Bank logo in the chin area. He wore a modified AGV helmet in the weeks following his Nürburgring accident so as the lining would not aggravate his burned scalp too badly. In 1982, upon his return to McLaren, his helmet was white and featured the red "L" logo of Lauda Air instead of his name on both sides, complete with branding from his personal sponsor Parmalat on the top. From 1983–1985, the red and white were reversed to evoke memories of his earlier helmet design. Lauda returned to running his airline, Lauda Air, on his second Formula One retirement in 1985. During his time as airline manager, he was appointed consultant at Ferrari as part of an effort by Montezemolo to rejuvenate the team. After selling his Lauda Air shares to majority partner Austrian Airlines in 1999, he managed the Jaguar Formula One racing team from 2001 to 2002. In late 2003, he started a new airline, Niki. Similar to Lauda Air, Niki was merged with its major partner Air Berlin in 2011. In early 2016, Lauda took over chartered airline Amira Air and renamed the company LaudaMotion. As a result of Air Berlin's insolvency in 2017, LaudaMotion took over the Niki brand and asset after an unsuccessful bid by Lufthansa and IAG. Lauda holds a commercial pilot's licence and from time to time acted as a captain on the flights of his airline. He was inducted into the International Motorsports Hall of Fame in 1993 and since 1996 has provided commentary on Grands Prix for Austrian and German television on RTL. He was, however, criticized for calling Robert Kubica a "polacke" (an ethnic slur for Polish people). It happened on air in May 2010 at the Monaco Grand Prix. Niki Lauda has written five books: The Art and Science of Grand Prix Driving (titled Formula 1: The Art and Technicalities of Grand Prix Driving in some markets) (1975); My Years With Ferrari (1978); The New Formula One: A Turbo Age (1984); Meine Story (titled To Hell and Back in some markets) (1986); Das dritte Leben (1996). Lauda credits Austrian journalist Herbert Volker with editing the books. Lauda is sometimes known by the nickname "the rat", "SuperRat" or "King Rat" because of his prominent buck teeth. He has been associated with both Parmalat and Viessmann, sponsoring the ever-present cap he has worn since 1976 to hide the severe burns he sustained in his Nurburgring accident. Lauda said in a 2009 interview with the German newspaper Die Zeit that an advertiser was paying €1.2m for the space on his red cap. In 2005 the Austrian post office issued a stamp honouring him. In 2008, American sports television network ESPN ranked him 22nd on their top drivers of all-time. Lauda has two sons with first wife, Marlene Knaus (married 1976, divorced 1991): Mathias, a racing driver himself, and Lukas, who also acts as Mathias's manager. Lauda has a son, Christoph, through an extra-marital relationship. In 2008, he married Birgit Wetzinger, who is 30 years his junior and was a flight attendant for his airline. She donated a kidney to Lauda when the kidney he received in a transplant from his brother, in 1997, failed. In September 2009 Birgit gave birth to twins, a boy and a girl: Max and Mia. On 2 August 2018 it was announced that Lauda had successfully undergone a lung transplant operation in his native Austria. Daniel Brühl, Niki Lauda and Peter Morgan at the premiere of Rush in Vienna, Austria. The 1976 F1 battle between Niki Lauda and James Hunt was dramatized in the 2013 film Rush, where Lauda was played by Daniel Brühl. Lauda himself made a cameo appearance at the end of the film. At this point Lauda said of Hunt's death, "When I heard he'd died age 45 of a heart attack I wasn't surprised, I was just sad." He also said that Hunt was one of the very few he liked, a smaller number of people he respected and the only person he had envied. Lauda appears in an episode of Mayday titled "Niki Lauda: Testing the Limits" regarding the events of Lauda Air Flight 004. ^ "F1's Greatest Drivers". f1greatestdrivers.autosport.com. Retrieved 24 March 2019. ^ "Mercedes give Toto Wolff and Niki Lauda new long-term contracts". skysports.com. Retrieved 22 February 2017. ^ Daily Express page 1, 8 & 16 BATTLE FOR LAUDA'S LIFE Monday 2 August 1976 "Heroes pull world champion from race wreck." ^ "Lauda, Hans". www.aeiou.at (in German). Retrieved 16 May 2010. ^ Was sind überhaupt Freunde?. In: Süddeutsche Zeitung. 9. Juli 2010. ^ Gerald Donaldson. "Formula One Drivers Hall of Fame - Nikki Lauda". Formula One web site. Retrieved 17 March 2013. ^ Tom Rubython: In the Name of Glory – 1976 Myrtle Press, 2011, ISBN 978-0-9565656-9-3, p. 163. ^ Lang, Mike (1983). Grand Prix! Vol 3. Haynes Publishing Group. p. 137. ISBN 0-85429-380-9. ^ "Lauda to join Mercedes in advisory role". GPUpdate.net. 28 September 2012. Archived from the original on 3 October 2012. Retrieved 7 October 2012. ^ "Hamilton's Mercedes switch was not motivated by money, insists Lauda". MailOnline. 30 September 2012. Retrieved 7 October 2012. ^ "Niki Lauda has renamed Amira Air LaudaMotion". austrianwings.info. 10 February 2016. ^ "Airline Niki goes to founder Niki Lauda". dw.com. 23 January 2018. ^ Clark, Andrew (6 November 2004). "Interview: Niki Lauda, aviation chief". the Guardian. Retrieved 4 September 2018. ^ "Formel-1-Experte Niki Lauda nennt Robert Kubica "Polacke"". www.shortnews.de (in German). 16 May 2010. Retrieved 16 May 2010. ^ "Lauda obraził Roberta Kubicę!". sport.wp.pl (in Polish). 16 May 2010. Retrieved 16 May 2010. ^ Lauda, Niki (1987). To Hell And Back. London: Corgi Books. ISBN 0-552-99294-1. ^ Kammertöns, Bruno (10 June 2009). "Es ist ein Glück, dass ich schon so viel Unglück erlebt habe". Die Zeit (in German). ^ "Austria Post honors Niki Lauda". www.stampnews.com. 20 September 2005. Archived from the original on 26 September 2012. Retrieved 16 May 2010. ^ "Kinser, Mansell, Garlits, Lauda, and Muldowney set high standards". ESPN. Retrieved 19 May 2008. ^ Press, The Associated. "Lauda Has Transplant". nytimes.com. Retrieved 7 August 2018. ^ "Niki Lauda 'in kidney transplant'". irishexaminer.com. 1 July 2005. Retrieved 7 August 2018. ^ "Ex-F1 world champion Niki Lauda is father to twins at 60". MailOnline. 19 September 2009. Retrieved 16 May 2010. ^ Bradley, Charles (2 August 2018). "Niki Lauda recovering from lung transplant surgery in Austria". autosport.com. Retrieved 3 August 2018. ^ Niki Lauda on James Hunt, Graham Bensinger, 11 October 2017. ^ a b c "Niki Lauda – Biography". MotorSportMagazine. Retrieved 2 February 2019. 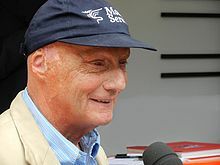 Wikimedia Commons has media related to Niki Lauda. Lauda, Niki; Völker, Herbert (1987). To Hell And Back: An Autobiography. Corgi. ISBN 0552992941.